Majesco's initial 3DS games are going to feature speed and braaaaaaaaaaaains. Majesco's been cleaning up with DS and DSi games like My Baby 3 and the various Mama titles. That's why it's a little surprising to hear that its first two games for the upcoming 3DS system are going to be completely original IPs: one will be a racing title and the others will see players raising zombies as pets. The first title is going to be called Face Kart: Photo Finish. The game will apparently let players create "a highly customizable racer or race track using the 3DS's cameras." The title will take care of the system's motion sensing technology and allow players to steer cars by simply tilting the 3DS in their hands. The other game is called Pet Zombies in 3D and sounds like it'll be a slightly more gruesome version of Nintendogs. 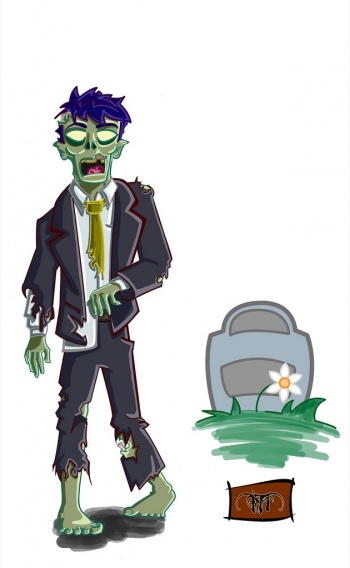 Essentially, players raise the zombies, feed them, and "mischievously torment" them; at the same time, the undead participate in minigames in order to earn customization upgrades. Face Kart: Photo Finish sounds like it could be a fun game for kids to play, especially with the way it utilizes the 3DS's camera. Pet Zombies, in turn, seems like it could be bizarre enough to be a blast for older gamers. I'm more than a little curious as to what (or whom) I should feed to a pet zombie. It should be noted that there's no art yet for either game, so this zombie is simply for your viewing pleasure.